On a rooftop in Manhattan, Raph and Casey are having a backflip contest. 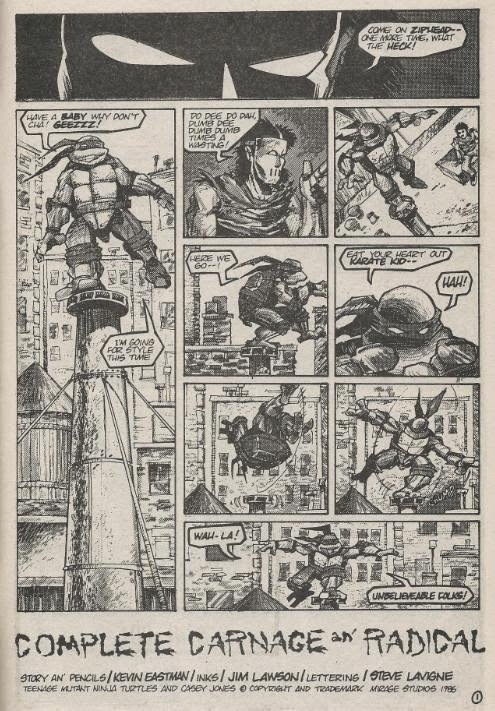 Raph, standing ontop of a chimney pipe, performs a perfect ninja flip…until the pipe breaks and he falls flat on his shell. Casey’s in stitches, but Raph fails to see the humor. At a loss for things to do, Casey recommends they head over to this abandoned old building on 6th Avenue he knows of so they can practice throwing Raph’s shuriken around. Raph’s all for it, so long as they don’t lose any of them, as he’ll have to come up with an explanation to Master Splinter if they do. As they sneak into the rundown old dump, their presence awakens a hulking, spiky monster in a cape. The monster is distraught, believing it to be his arch-nemesis and regrets that he has yet to finish healing from their last encounter. Raph and Casey then meet the monster face to face, who introduces himself as none other than that villain of greatest renown: Complete Carnage. Raph and Casey have heard of Complete Carnage and immediately wet themselves. As Carnage prepares to destroy them, his real arch-nemesis, the super heroine known as Radical picks him up on her “sensing sense”. She swoops down to the building, plows through a brick wall and tackles Carnage. The two foes trade several blows and some very uncreative banter before Radical drags Carnage out of the building and up into the sky. Fed up with him, Radical chucks the world’s lamest super villain straight to Arctic. Down at the old building, the awe-struck Raph and Casey are still trying to get a handle on the face that they just saw a battle between a superhero and a super villain. They decide to slink off in case either of them might come back and Casey once again leads Raph to a “great place” for shuriken practice. Now on top of a building, Casey wins the target contest, but sends Raph’s shuriken flying three blocks away. Raph is not amused. *The Turtles will meet Complete Carnage and Radical again in Tales of the TMNT (Vol. 1) #5. *This story was later republished in the “Shell Shock” trade paperback and then again in the "TMNT 25th: A Quarter Century Celebration" trade paperback. And low, we have the introduction of two of the TMNT’s most random supporting characters ever: Complete Carnage and Radical. I never really knew what to think of them. They just sort of existed in the book, popping up whenever Eastman and Laird needed to get their “superhero” fix out of their system and then promptly disappeared back into crazyland where they came from. Their introduction here is very similar to the introduction of Silver Sentry in the 4Kids cartoon episode “The Unconvincing Turtle Titan”. Superheroes and villains are just supposed to be a given as existing in the universe of the Ninja Turtles and you aren’t really supposed to give it much of a second thought. “Complete Carnage an’ Radical” does a decent job of getting that fact across, as Raph and Casey simply blunder into a running battle between two super-foes and don’t even rate participation. Heck, Radical doesn’t even seem to notice them. As for the two super characters, well, they’re kind of intentionally lame in this story. Carnage has yet to manifest his ability to absorb manmade materials and Radical's still a silly caricature of goofy superhero stereotypes (she gets over this later on in the series and grows up, thankfully). They’re just these two ridiculous super-dorks, going about their business while Raph and Casey try and go about theirs. And speaking of Raph and Casey, these back-up stories featuring the two of them paling around are some of my favorites (albeit there aren’t a whole lot of them). You can tell that there was a lot of “bonding” between the two buddy characters between Raphael (microseries) #1 and TMNT (Vol. 1) #10, but you never got to see it in the main TMNT series. These back-ups give you a nice glimpse at the two kindred spirits fairly early in their friendship and fills in a neat little gap in character development. Overall, at only six pages, “Complete Carnage an’ Radical” isn’t much of a story, but it’s fun for what it is. 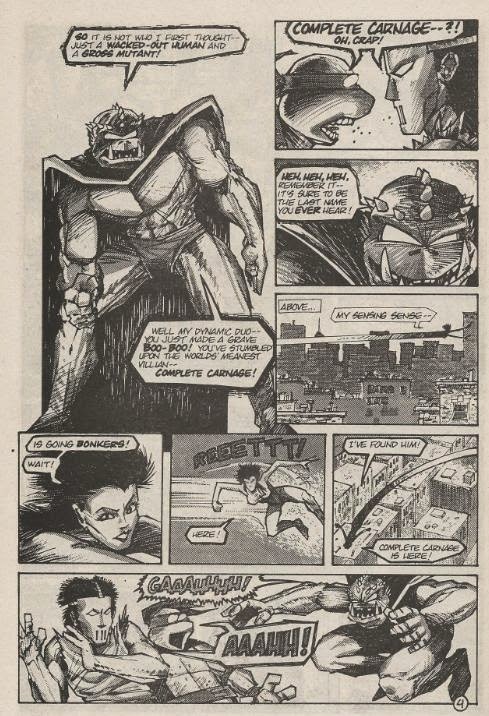 Being one of the few short back-up strips to actually be referenced in issues of the main series, it’s also somewhat important for continuity purposes, if you’re one of those folks that gets driven up the wall by those little editor’s notes*.